Since the beginning, Stardust has consistently encouraged environmentally sustainable practices by providing programs and services that aid the community in efforts to waste less and reuse more. Proceeds generated from our stores help support our mission and community programs that provide essential materials to local non-profit organizations serving families and individuals in need. Please submit your application to gik@stardustbuilding.org. Proceeds from the Stardust Building Supplies reuse centers partially support our Gifts In Kind(GIK) program, which provides more than 360 non-profit organizations with essential items including toiletries, housewares, and building supplies to help serve the community. We partner with local retailers to collect overstocked, returned, or slightly damaged inventory that would otherwise be thrown away. We then redistribute it to non-profit organizations who can use the donated items for clients or operational needs. Since 2012, our Gifts In Kind program has distributed more than $22.4 million dollars to 360 Maricopa County non-profit organizations. To be eligible for the program, a non-profit must show their 501(c)(3) letter and serve individuals in the Maricopa County. 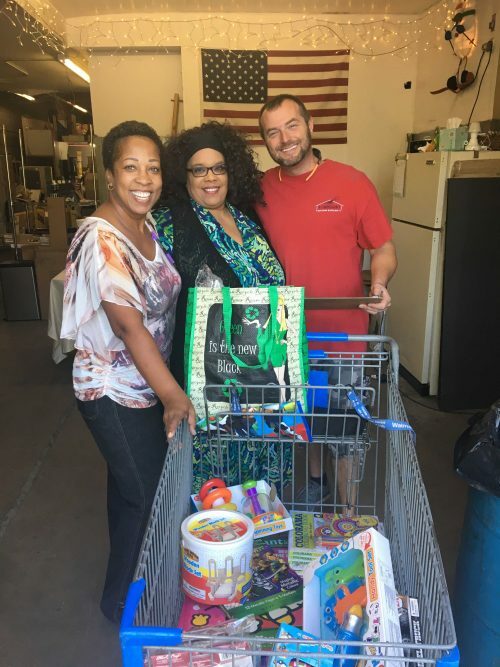 Non-profit organizations are then able to come to the Gifts In Kind distribution center located at our Glendale store once per month to select items they need for their organization–these items can be for organization use or client use. Stardust partners with Valley of the Sun United Way in the Gifts In Kind donation program, bringing resources valued in the millions to our local community. Thunderbirds Charities proudly supports Gifts In Kind. Please note that the Gifts In Kind program is not open to the general public and is open Tuesday, Wednesday, and Thursday from 8 am – 1 pm, by appointment only. If you work for a non-profit organization and would like to participate in the Gift In Kind program, please fill out the Membership Application and submit to gik@stardustbuilding.org. For more information, please contact the Gifts In Kind Administration at 480.668.0566 ext. 5. Our skilled deconstruction crews save more than 650 tons of usable materials a year.